I have been asked from time to time, what would you do with that old pulley? And, yes we have some in the store! 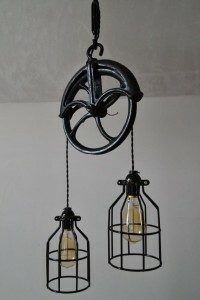 There are a lot of creative ways you can use an old barn pulley ~ take a look at this awesome light! This would work in a rustic kitchen, cabin bathroom or even as your beside you bed. We would love to see how you use old barn pulley’s.